For those of you that still have some turkey left in the freezer from the this past spring’s season it’s time to introduce the bird to the grill. Now there are lots of great ways to grill wild turkey, but one of my favorites is the shish-kabob. (Ironically, the term ‘shish-kabob’ has Turkish origins). They are simple, fun to make and extremely delicious. Start by cubing turkey meat into roughly 1 inch pieces. Oftentimes I give the meat an overnight, refrigerated bath in Italian dressing or other vinegar-based marinade. This adds some flavor without overpowering it and can help make the meat of older birds a bit more tender. 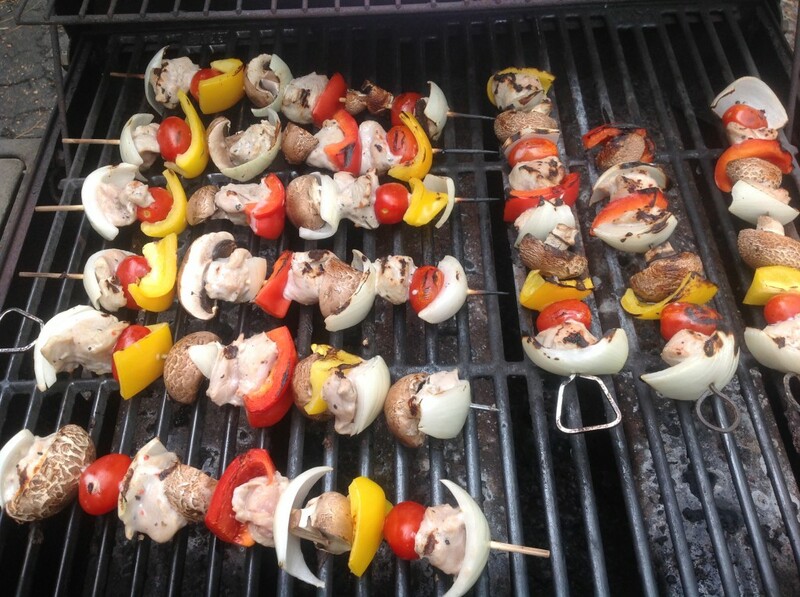 When ready use metal or wood skewers and alternate meat chunks with your preferred veggies and extras. My family likes to use slices of onion, bell pepper, fresh mushrooms and whole cherry tomatoes. I have been known to add pineapple, squash and even jalapenos to the mix, as well as sprinkling a kabob or two with crush red pepper. Be creative. Once ready I toss the shish-kabobs onto a prepped grill at medium heat and keep a watchful eye on them. I want to cook the wild turkey and heat up the other goodies. Neither takes very long. I turn my skewers often to avoid burning the turkey…singeing edges on the rest of the items is going to happen. Cooking is done when all exposed sides of the turkey chunks on a kabob have turned white. This should make the turkey melt-in-your-mouth tender and avoid the chewy-texture that happens when overcooked. Be ready to eat as soon as the kabobs come off the grill. The cubed meat and sliced extras can cool quickly…but usually disappear before they get the chance.